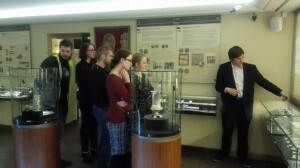 The European Foundation of Human Rights (EFHR) staff and volunteers visited the Money Museum of Lithuania on Tuesday 29 March 2016. Our European Voluntary Service (EVS) volunteers Aneta Maciejewska and Leah Nedahl as well as Erasmus + intern Przemysław Ogrodnik thoroughly enjoyed the trip. The tour was very interesting and gave our volunteers a great overview of the history of money, as well as the evolution of banking and money in Lithuania. Visitors can learn about the interesting history of money (for example: did you know that the first currencies were cattle and seashells?) and see a range of coins and banknotes from around the world. During the tour we each minted our own coin bookmark souvenir and had the chance to take a close look at banknotes to learn how governments try to prevent counterfeiting. There are also plenty of interactive exhibits at the museum – for example, visitors are invited to step on to a weighing scale in order for their weight in gold to be calculated and to complete a quiz at the end of the tour to claim a prize. We also saw the famous money pyramid, which has been given a place in the Guinness Book of World Records for being the largest money pyramid in the world. The exhibit, which is comprised of 1,000,935 centas coins, was built to honour Lithuania’s former currency (litas) prior to the adoption of the Euro in 2015. This was not the first time that EFHR staff have enjoyed office field trips. Previous excursions have included the Kurier Wileński newspaper offices and printing press to learn more about the media industry and the history of this important publication, as well as a trip to the Seimas and a tour of Vilnius City Municipality. We are all looking forward to our next trip!